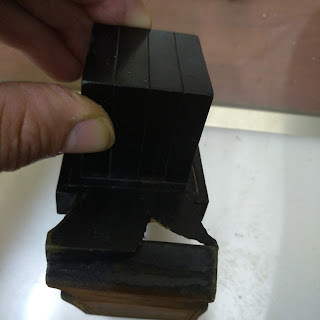 I recently had the opportunity to check a very special pair of tefillin, belonging to the late esteemed Chabad chassid Rabbi Shmuel Levitin Z"L. Rabbi Levitin passed away in the 70's and his tefillin were handed down in his family. As to be expected, the parshiyos are extremely unique in the fact that they are an old "Alter Rebbe" ksav, from the old Chabad Russian ksavim (not the new post war style). The shel rosh was replaced over the years due to age, but the shel yad is original. It must have been checked many times over the years as I can see fresh tikunnim here and there. I would imagine Reb Shmuel's tefillin would have been written by a reputable sofer and clearly they were checked by many (presumably reputable Chabad) sofrim during the course of his lifetime, both in Russia and the US. I am unsure if these were the only pair of tefillin he had, but they were definitely his and well worn. So here is the thing. In these parshiyos, every single ches was done in such a way that the right was NOTICABLY thicker (and taller ) than the left. You simply don't see that today, even by the best of sofrim. What's even more interesting is that the lamedim were not as consistent. there were plenty where the left was taller than the right. There is no question that these tefillin have a strong Chabad lineage and as I said previously would have been written and checked over the years by reputable Chabad sofrim from generations gone by. UPDATE: SINCE POSTING THIS, I RECEIVED AN EMAIL EXPLAINING THE REASON WHY CHABAD SOFRIM ARE NOT NOHEG TO THICKEN THE RIGHT SIDE OF THE CHOTETERES - BECAUSE IN REB RUVAIN'S PARSHIYOS HE DID NOT DO SO. 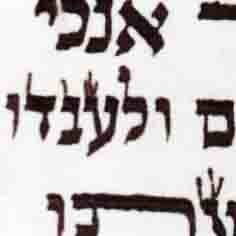 THAT IS BESIDES THE POINT THAT REB RUVAIN IS ONLY A GUIDE FOR HOW TO WRITE KSAV HAMEYUCHOS, NOT KSAV ARIZAL. 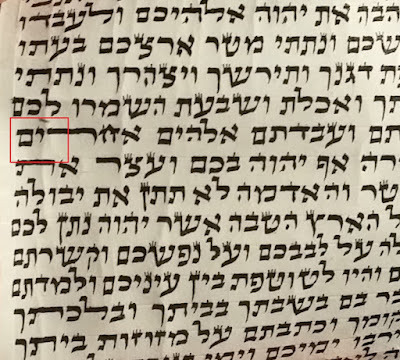 AT ANY RATE MY QUESTION STILL REMAINS: WHOEVER WENT ALL OUT IN RECENT YEARS TO MAKE A VERY BIG ESEK OF THE TAGEI LAMED (OVER AND ABOVE THE WAY REB RUVAIN WROTE), WHY IGNORE THE CHESIN IF IS THE SAME THING AL PI SOD? Finally, the explanation I have heard from Rabbi Heller and others who quote it in his name, that he pushes it because of the story with the Rebbe where someone was instructed to have his tefillin checked numerous times and finally someone fixed the tagei lamed, and then the Rebbe stopped instructing: Who's to say that the chesin weren't already thicker on the right side in those parshiyos (ie like Reb Shmuel's above)? I plan on calling Rabbi Heller this week to try and get to the bottom of this. I do not see in any of these pictures that the right part of the chatoters is thicker than the left, do you have more pictures? I just took one random picture of the ksav before I sewed them back up. My intention was not to to take any pictures of the ches so I did not really focus on this. However I tried to crop and blow up whatever cheses i had. So if you look at say the ches in rechem you can see that the right side is thick, leading to a ball / point on the top. But the left side, from the roof of the zayin to the ball, is much thinner. All the cheses were like this, with the left part going from the zayin to the point being very thing. its hard to tell in the other chesses, because they are out of focus and blurry, but it was consistently like that throughout the parshiyos. If it's the same reason as the lameds, why is it different?